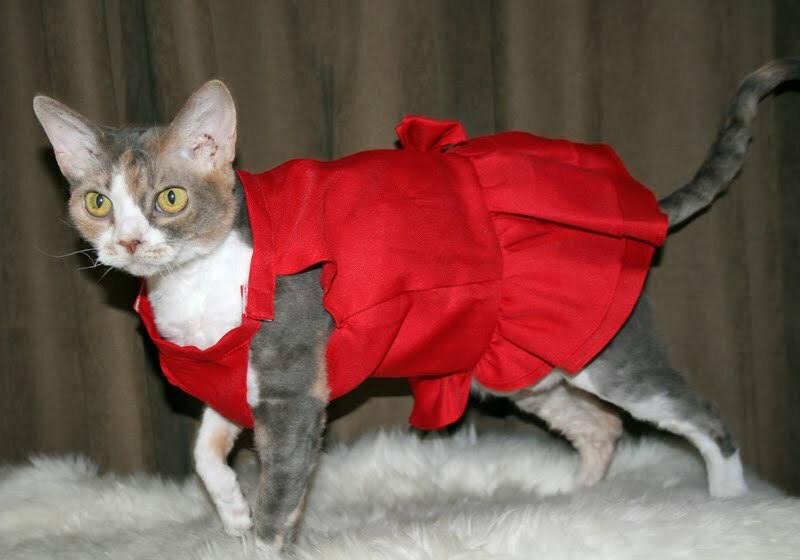 Every cat should have a little red dress! I think this sporty pose shows off my dress real good. Did you notice my jaunty tail? Since this dress is a little bit plain, I might need some extra props. What do you think of this fancy pink wand? Pink and red sometimes go together. But not always. Prop, you might have let me down today. My dress is altered with a binder clip! This makes me a little bit crabilated. Daisy, sometimes modeling sessions just don't go right. And I hear that even human models have to wear clothes with clips in uncomfortable places. So don't get TOO crabilated! Daisy, I am sure this will start a trend. You can expect ladies everywhere to b e sporting binder clips as fashion statements. Perhaps you can start a line of different colors of binder clips to use with different dresses. You look good in red, by the way! Hi, Daisy! You look like Valentine's Day and that makes me happy. And I needed a happy. All the good models use the clips. Looking pretty in red Miss D.
Clips, tape, tissue, velcro... there are lots of little tricks in the supermodel world, Daisy! Have a snack, everything will seem better! As every fashionista knows, Daisy, it's not just what you wear but how you wear it. You're such a pro! That is a cute little red dress, Daisy! And we had no idea that binder clips could be used for dress alterations!! How smart of you!! You're wearing your dress real good, Daisy. I am wondering why I don't have a pretty red dress. Daisy you are just the best model ever. We are just glad to get back on your blog after yesterday.Glad everything is OK.
We love your red dress and that bad prop just didn't behave. Norty prop. So that's how all of the high fashion models keep their clothes on! That's a lovely dress, Daisy. I would love to see my feline sister Rosie in a red dress. I think she would look very nice in it, but I am not sure she would be as well behaved as you! That's a beautiful dress Daisy. And don't worry about the binder clip....human models have to put up with worse to have a good photo shoot. Just ask for extra snacks in payment. Daisy, you are such a wonderful model! I think you wear your dress very well! Red is YOUR color. Have a nice weekend and find a fun party to wear your dress to. You look beautiful in your red dress Daisy. Don't be crabilated. All the top models have their little secrets to make the clothes they model look their best. Your dress is very pretty Daisy. We hope your Mommy didn't pinch your fur when she put the binder clip on your dress. That would have been ouchie although we know you are too good a model to let it show. Your dress is so pretty, we love the bow on the back. Mom uses binder clips when she photographs dresses that she is selling. You're such a pro to only be a little crabilated! i told the boyz that you thought every cat should have a little red dress. they didn't look too much like they agreed. You're looking LOVELY in your red dress. Mom loves the bow on the back! 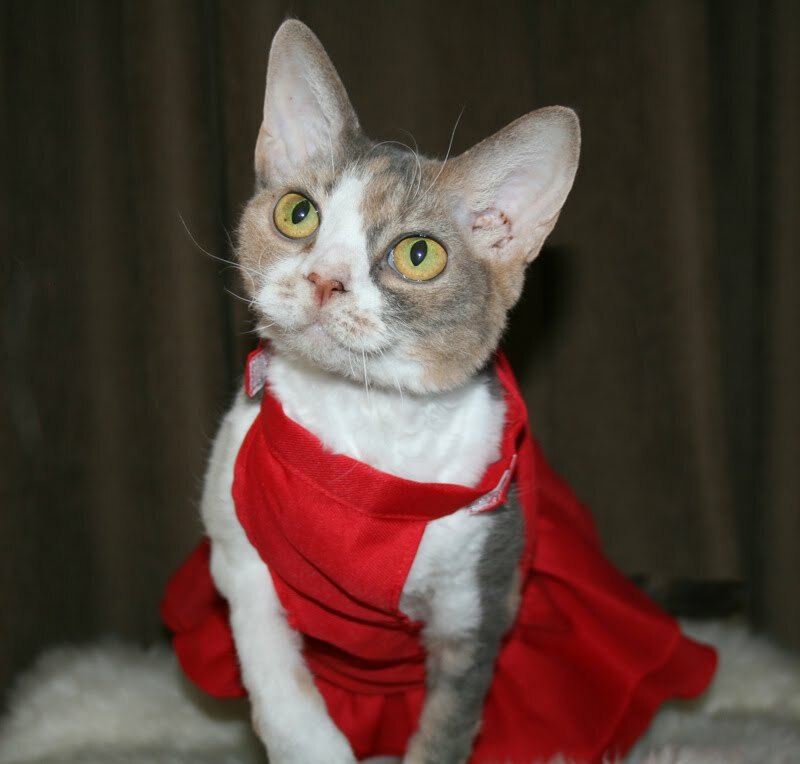 four paws up, miss daisy--you looks furry cute an' sassy in that red dress!! xing finks you should assessorize wif some big, chunky pearls. why does the clip make you crabiliated? surely yer mamma din't pinch yer furs wif it, did she? That's a lufferly bow on your red dress! Even with a binder clip holding your dress on you! you need to save one of these shot for a valentine, Daisy. Red is SO yoor colour! you will be making skeezix breath hard today. Belle of the ball as always Daisy, even with a clip in situ. Nothing can detract from how effortlessly you make modelling look. Oh Daisy, you don't need props, just your adorable self is enough to adorn any fashun. Is the life of a profeshunal model to has clips on their clothes. You handled it very well fur the foto shoot! P.S. we loves the outfit you gets for Skeezix's bifday. It was lovely! Daisy, we think models with such svelte figures always have to use those clips so don't be crabilated! We're jealous of the clip because we aren't svelte model types. Duzn't mind teh binder clip, you looks adorabuls even crabilated! Just keep your front to the camera and no one has to know. Gosh Daisy, we're so used to seeing you in pink, it looks odd to see you in red! But you look great either way. We love the back of your dress. It looks like a fancy evening gown. You should have Skeezy take you out dancing! I have a small wardrobe for Kit, and that dress is a part of it. I'll have to take a photo and share. what a lovely dress! just right for a friday night dinner and a movie out with someone you love. and thank you for sharing your modeling tips, i did not know world famous models used binder clips for holding dresses in place. i have seen them used on the bridal gown shows on tv, but i thought those were just to help brides. have a great weekend!! That bow with the sparkles in the back is especially fetching! 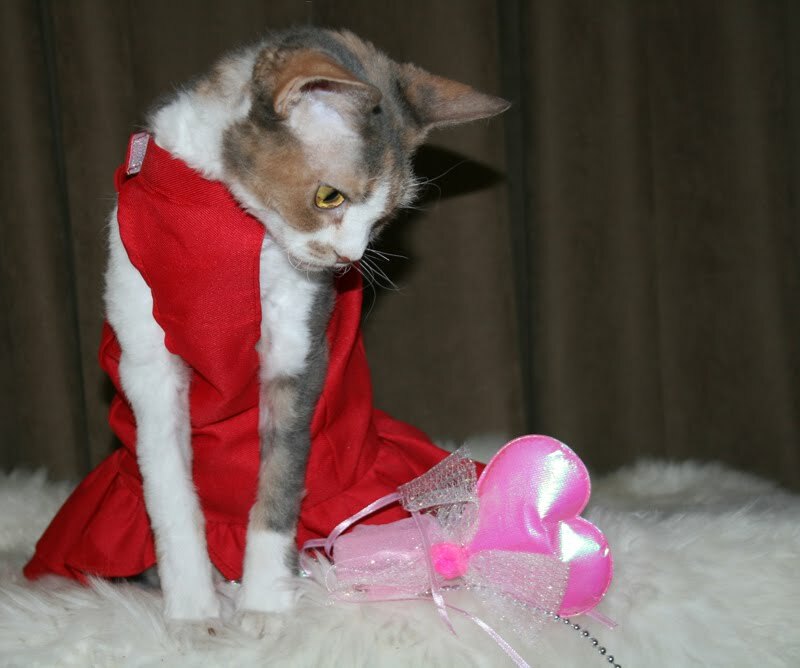 Daisy, you know you're up there with the big-time models when your fashions have to be altered for a photo shoot! Daisy darling, you are THE most glamorous and beautiful supermodel I have EVER seen. 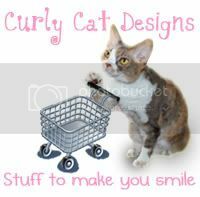 You look simply stunning in your little red dress and the binder clip...that will start a fad with kitties the world over! Everyone will want to wear their dresses just like you. You know how to style, little girl! By the way, red suits you. Do you also have a little black dress? Goodness I just glanced over at the comments and Simba said the same thing. See? We agree! Oh Daisy, what a beyootiful dress! We know at fashun shows sometimes dey hafta tape, staple, glue and binder dem models into dresses so don't be too crabilated. Miss Daisy, my mom says the bow on the back of your wee red frock is muy kyoot! I think that since the prop and the binder clip have made you feel crabilated, you need extra TREATS! We think you look fabulous, despite the clip and the prop not behaving properly! There is nothing plain about you Daisy that's for sure! Very stunning dress. I hear that the top fashion models in all those magazines do alterations the same way. I bet they get crabilated too. oh what a lovely dress honey! Daisy we think you look beautiful in your red dress. It is too bad that you have to have the clip but well, you are a petite ladycat so sometimes things do need a little help. Maybe you can get a jeweled clip to use next time you wear it! 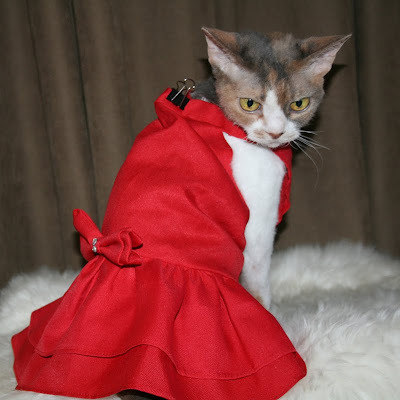 Do you really think everycat should have a red dress, Daisy? Even Harley??? You do look a bit crabulated about the binder clip. Try to ignore it, because you do look lovely. Seeing yoo in that red dress kinda givs me ::wispers:: urjes. The FL uses binder clips to alter my clothes a lot cuz I have a vary skinny nek too. The little red dress is OUTSTANDING! Your red dress is pawesome, Daisy! Thanks for sharing the trick! 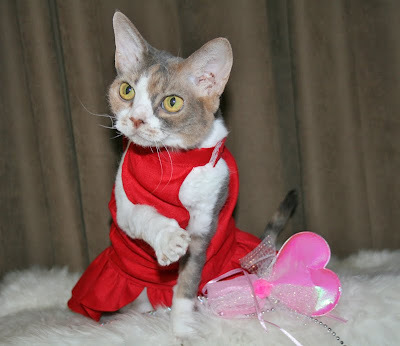 Your Mommeh made it a halter dress! How clever of her. Theresa and kisses from Baby Harper Jane, too! You might be a little bit crabbilated but your red dress is lovely Daisy! I do not think the pink wand really goes, though. Daisy, I think you really rock that binder clip. Maybe your Mommeh can paint it pink, so it (kind of) goes with your dress? Oh Daisy, your facial expressions just CRACK ME UP!!! Your clip solution reminds me of the mannequins in store windows, all secretly pinned tight at the back to make them look better. and i always thought pink was your color. RED is so YOU! Hi Daisy! That is a very beautiful red dress you are wearing! 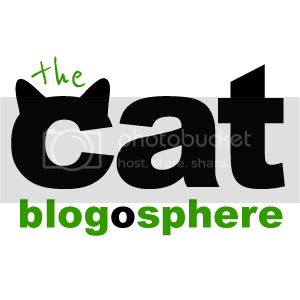 We just wanted to tell you that we have a new blog (okcats.blogspot.com). You don't know us, but your Mom was very nice and helpful to our mom when she was looking to adopt a new cat last year. 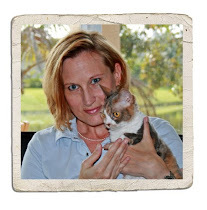 She finally decided to let us have a blog, and we just had to come by and leave you a comment! We hope you had a very nice weekend! Where's your diamond brooch Daisy? Daisy you are looking pretty as ever, especially in red. You are a model Daisy and sometimes models do get clipped, sewn in and sometimes their accessories just do not work..............but you are Daisy and whatever you model is perfect no matter what. I think you should talk to your tailor... That is a funny way to alter a dress. I wrote earlier and told you of my Kit owning the same dress. Well I promise to never let you two show up at the same events wearing it.